It was exciting to be at the Eagle Commission/Grace Brethren Investment Foundation dinner on Tuesday evening during Vision2020, the national conference of the Fellowship of Grace Brethren Churches. 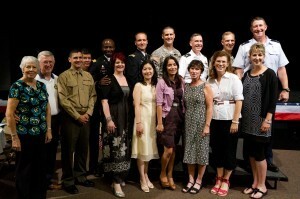 One by one, the chaplains shared about their ministries, which range from being on the ground with soliders on a regular basis to teaching at the U.S. Army Chaplain’s School. It was a reminder to uphold these men in prayer on a regular basis. Here is one request that was shared in the recent Eagle Commission newsletter. It comes from Captain Pete Stone, who is stationed at Fort Campbell, Ky. I have recently been assigned to a light infantry unit. These Soldiers are some of the most dedicated and sacrificial people I’ve ever known. I’m deeply privileged to serve as their chaplain. I’ve gradually begun to earn their trust. The other day several of us engaged in a conversation about spiritual matters. The conversation came to a point where I sensed they were comfortable enough with me that I had the freedom to invite them to begin a Bible study with me. They heartily agreed. Later in the day one of them sent an email and said, “Chappy, I’m not trying to tell you what to do, but why don’t you advertise this to more folks? I think they’d like something like this.” This guy is one of the strongest leaders in our unit, so it meant a lot for him to make that suggestion. We are going to begin working through Tim Keller’s book, The Prodigal God, starting next week. 4) that hearts would be transformed unto God’s glory through this study.